Tyrian, a 5 year old hyacinth macaw, enjoys the views from her trailer. You make provisions, and you get creative. Meet Tyrian. She’s a 5 year old hyacinth macaw – the largest in the macaw family – who lives with Deborah Dorsey, the owner of GreyHaven Exotic Pet Boarding and the founder of the Middle Tennessee Cage Bird Club. Deborah is Tyrian’s fourth home in five years, which can happen when people do not research and know what to expect with such a large bird. Her second home was in Japan where they did a procedure that permanently maimed her wings, rendering her flightless. Hyacinth macaws are very social, and to attempt to make up for her loss of flight, Deborah and her husband accepted her into their home with the understanding that Tyrian needed to have lots of attention and socialization. Pretty much when the weather is right, where they go she goes. 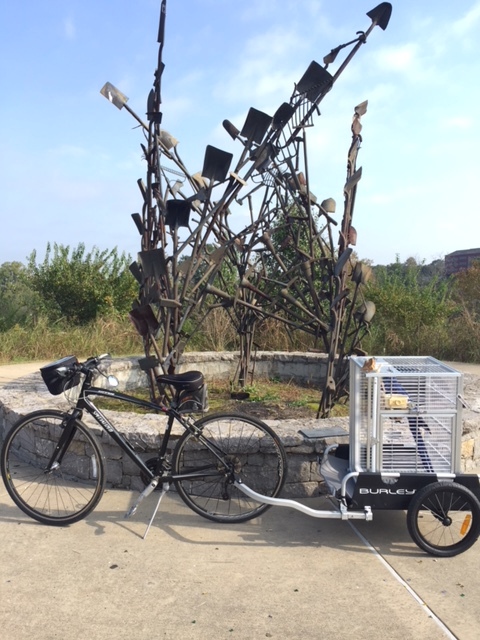 Bike Riding – with a Bird? Tyrian, a 5 year old hyacinth macaw, rides in a specially-constructed trailer with her caretaker, Deborah. Needless to say, Tyrian attracts quite a bit of attention when Deborah and her husband are out riding in Nashville. “We are slaves to the Garmen Vivosmart, so our daily steps take up enough time we had to figure out how to bring her along. 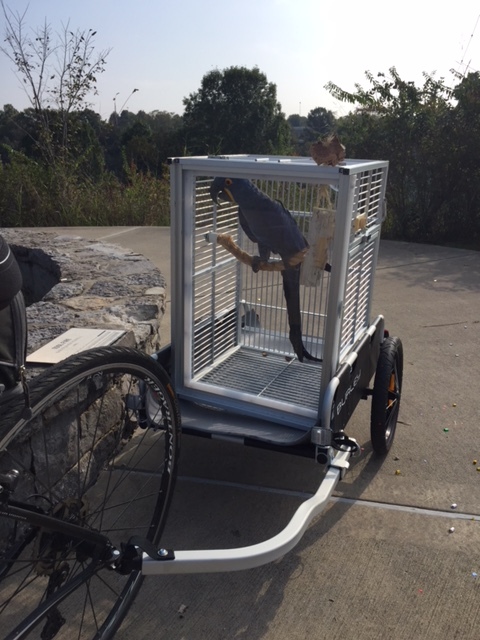 Thus the birth of the Parrot Stroller followed by the Burley Bird Biker,” says Deborah. The Burley Bird Biker is a Burley Flatbed trailer which has been specially fitted for Tyrian’s needs. The custom aluminum cage has a piece of plexiglas on the front to act as a windscreen. Deborah admits “the fewer hills the better,” though. Deborah remarks that Tyrian generally flies under the radar (so to speak) on the trails until someone gets right beside her. “She has her picture taken a LOT and she is a big poser whenever anyone gets out a camera,” says Deborah. Deborah rides a Specialized hybrid when she pulls Tyrian – truly appropriate for this special pair. Thanks for sharing your story, Deborah! Next Post:Why Use Bike Fun?